Late last week, we reported that in its latest push to limit and/or halt capital outflows, China unveiled new capital controls meant to stem further capital flight disguised as outbound M&A by clamping down with tighter controls on Chinese companies seeking to invest overseas, intensifying efforts to slow a surge in capital fleeing offshore amid tepid growth and an uncertain economic outlook. Beijing was said to focus on “extra-large” foreign acquisitions valued at $10 billion or more per deal, property investments by state-owned firms above $1 billion and investments of $1 billion or more by any Chinese company in an overseas entity unrelated to the investor’s core business. The new controls would apply to deals yet to receive approval from China’s top economic planning agency. One month after we noted a Bloomberg report that China was preparing to impose curbs on Bitcoin - which has in the recent past become a widely accepted mechanism to bypass capital controls - including policies restricting domestic bitcoin exchanges from moving the cryptocurrency to platforms outside the nation and imposing quotas on the amount of bitcoins that can be sent abroad, overnight we learned that China was taking a page out of the Indian demonetization playbook, and was curbing gold imports in another attempt to clamp down on capital leaving the country. As the FT reported, some banks with licences have recently had difficulty obtaining approval to import gold, they said — a move tied to China’s attempts to stop a weakening renminbi by tightening outflows of dollars, the banks added. 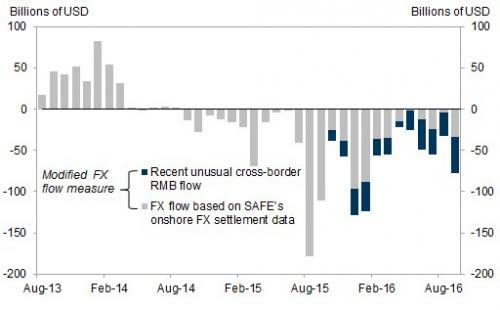 To summarize, in just the past month, China has unveiled at least three distinct sets of "controls" aimed at curbing capital flight out of China, at a time when as Goldman calculated recently, the true extent of capital outflows if far greater than what is reported by the central bank. Then, overnight, the PBOC added a fourth unique form of "capital control" when China’s central bank announced it would limit the amount of renminbi that Chinese companies and individuals can remit outside the country, "imposing a cap for the first time in more than two decades", according to the SCMP, to stem the yuan’s outflow as the currency plumbs daily lows. As the Hong Kong publication reports, companies domiciled in China will be limited to net currency outflows equivalent to 30 per cent of the owners’ equity, according to Order No. 306 issued Monday by the People’s Bank of China. Commercial banks should “utilise an integrated prudential management for cross-border payment in both foreign currency and yuan,” according to the central bank’s statement. This is a stunning reversal in government policy, which had previously encouraged the renminbi’s worldwide usage, part of a long-term strategy to internationalise the currency, culminating with the renminbi's admission into the IMF's SDR basket. Needless to say, the latest announcement will hardly impress the IMF which has been pushing for less government control of the currency. As SCMP notes, among the other measures, not listed above to halt capital flight, the central bank has instituted a range of measures to plug gaps where the currency could be remitted amid its 7 per cent slump this year against the US dollar, from banning Chinese citizens from buying insurance policies offshore, to requiring credit card companies to seek currency licenses.